Lis Dunn Designs: Motivation Monday... Because you can! It has been just over a week since my last run! It only takes 2 or 3 days, not only to see the physical decline but to really feel the mental and emotional impact of not running. I WILL NOT go that long again! Just after I got all of my babes out the door this morning, I took off for a run. "Please tell me that when we get to heaven we will run a marathon together"
Cait is the sweetest, most determined and most amazing teenage girl you will ever meet! Because she was born with CP, her body physically will not allow her, right now, to run. Her goal... to walk across the stage at graduation in May, 2013! 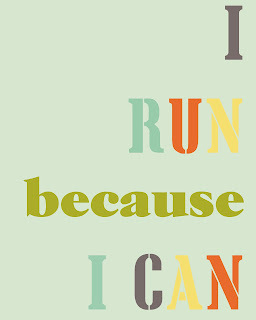 I will run because I can. I love this post! I have HORRIBLE knees, so I physically CAN'T run. It makes me upset when people complain about "having" to run to exercise. I would give ANYTHING to be able to run. Or jog. Or even speed walk without pain. Now I just need to apply this lesson to OTHER aspects of my life. Thanks for the reminder! Great post - and a wonderful positive poster too!